I'm still not fulling groking exactly how "real" applications are designed in a functional programming language. For example, in this daft app what should the separation of concerns be? Does MVC have a functional counterpart? 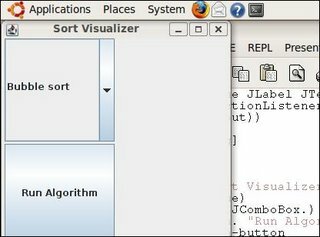 Next on this list is changing the code (prn alg) to actually render what's going on with quicksort and bubble sort. doto syntax saves lots of repetition! What's the idiomatic way of drawing something on the screen? Do I need to be using timers? Probably! It's been added to clojure contribs as well. Thanks for pointing that out, I'd not heard of MigLayout. Looks interesting! By the way do you know of a good clojure group in the UK? I'm learning myself and as a student its a nice change from coding in Java I'm still unfamiliar with good practice when it comes to debugging. At the moment I'm very REPL dependent and I'm muddling around with the emacs inspector. I'm considering sitting down and writing some debug functions so I can assess objects a bit more finely. I think at some point some peeps in London have met too. Not sure of anywhere else! Thanks Simon - good point. I was always running this in a REPL and typing (sortapp) to activate it, but I should have put it in the main code too!